I wasn’t going to post about the recently released 2016 Sunshine list, but I was ‘egged’ into it. I really don’t have a problem with what people are paid as long as they are doing their job and they are earning what they are paid. Given my regular interaction with the senior staff in Parry Sound I won’t complain. They seem to be ‘earning their pay’. The table above summarizes the combined salaries and benefit figures reported for the area municipalities. Each of the municipalities uses slightly different titles for the various senior management positions so I have associated them to the best of my abilities. In the case of the Archipelago and Parry Sound there are a couple of positions that don’t fit the standard categories, these are Corporate Services and Emergency and Protective Services respectively. This next table relates the cost for each position as a function of fulltime residences. It reveals a number of significant discrepancies in terms of the cost of all Sunshine List senior staff for municipalities, from a low of $47 per person, to a high of $1,167. But this is really not a fair comparison as some of the municipalities have far more seasonal than fulltime residents. Unfortunately, the census data doesn’t provide information on seasonal resident numbers. So let’s look at the same Salaries & Benefits figures as a function of the total Private Dwellings in each municipality. This includes both fulltime and seasonal properties. This figure is closer to a reasonable estimate of Sunshine List ‘efficiency’, but it does not include the impact of businesses. If the number of business properties were to be included I suspect that Parry Sound would show a much more favourable ‘efficiency factor’. So there are the 2016 Sunshine List figures with a little bit of analysis. 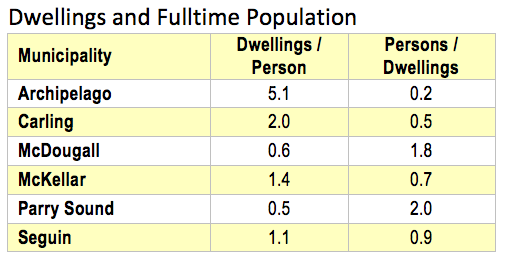 A set of figures from the 2016 Census report that a I found interesting relates to municipality fulltime population and the number of private dwellings (below). The numbers range from a high of 5.1 dwellings per person (Archipelago), to a low of 0.5 dwellings per person in Parry Sound. The difference obviously is the large number of seasonal residences in the Archipelago, Carling and McKellar. Those simple figures tell you everything you need to know about why amalgamation will not be something the municipalities spontaneously decide to do. It’s possible to imagine a Parry Sound and McDougall amalgamation, and perhaps an Archipelago and Carling amalgamation if they wanted to get better efficiency. The ‘business models’ are reasonably aligned. But don’t even think about it, much less talk about it. It’s a bit like integration in the U.S. South in the 60s. It took Federal legislation to make that happen. In the case of West Parry Sound it will take Provincial legislation. With Bay Street just a short walk away from the Provincial Legislature it’s – not – going – to – happen. Ever! The 2016 Sunshine list is a bit of a bear to work with. I didn’t come across a simple PDF version as in earlier years. It’s available as a variety of data dumps. The easiest in my opinion was the CSV format file that can be searched with Excel. The municipalities that have only a single person hitting the Sunshine List may well have personnel just under the $100,000 cutoff, who would not be included in this report. It’s interesting to see how many police officers are on the Sunshine List. In the end, I think our neighbouring municipalities took the prudent course of action by biting the bullet and continuing on with OPP service.